Once again, higher gold and silver prices have impacted the numismatic product offerings of the United States Mint. Four available gold coins had their prices increased, while two sets containing silver coins were suspended. 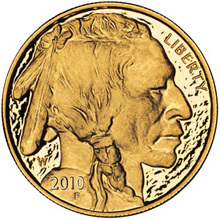 In January 2009, the US Mint adopted a more flexible pricing policy which covered certain gold and platinum numismatic products. Under the policy, pricing adjustments can be made as often as weekly, based on the average price of the metals. The policy covers numismatic versions of gold and platinum bullion coins, as well as the one-half ounce 24 karat First Spouse Gold Coins. The policy does not cover commemorative coins or numismatic products containing silver. On April 13, the price of the 2010 Proof Gold Buffalo was increased from $1,710 to $1,760 based on the policy. This product originally went on sale May 5, 2010, priced at $1,510 per coin. Through the most recent sales report, the US Mint has sold 48,104 of the one ounce 24 karat gold coins. This is approaching the final reported sales for the 2009-dated proof coin, which were 49,388. The US Mint also raised the prices of the First Spouse Gold Coins, with proof coins increased from $879 to $904, and uncirculated coins increased from $866 to $891. Following numerous sell outs, the only coins that remain available are the proof Abigail Fillmore, and the proof and uncirculated Mary Todd Lincoln coins. Earlier in the week, the US Mint suspended sales of the 2010 America the Beautiful Quarters Silver Proof Set and the 2010 Silver Proof Set. These products contain coins struck in 90% silver, which yield silver content of 0.90420 and 1.33823 troy ounces for the quarter set and full set, respectively. When last available these sets were priced at $39.95 and $64.95, compared to a current silver value of $38.08 and $56.37. Each of these products were previously suspended and repriced less than a month ago. Since these products are not covered by the more flexible pricing policy, pricing adjustments are implemented through publication in the Federal Register. This process can take several weeks. In the meantime, the suspension of sales is expected to continue. As an additional note, the Mint magically did not release the Eliza Johnson gold spouse coin when it would have been much more affordable to collectors instead opting to wait almost two months when the prices would be much higher. The Mint is either completely incompetent or completely criminal…there are no other options.